Low soil temperature in spring is a major constraint for cultivation of tropical crops in temperate climates, associated with impaired seedling development, inhibition of root growth and root activity. In this study, potential cold-stress protectants, such as supplemented micronutrients (Zn, Mn), seaweed extracts, and rhizobacteria with plant growth-promoting potential (PGPRs) were tested in order to improve the tolerance of maize to low root zone temperatures (RZT) during early growth. Maize (v. Colisee) was cultivated in a root cooling system for adjustment of the RZT. In three independent experiments, after germination at 20 °C, the cold-stress phase (12–14 °C) started at 14 days after sowing to simulate a cold period in spring. Micronutrients, seaweed extracts, and PGPRs were supplied by fertigation (experiment 1), fertigation and seed dressing (experiment 2), and nutrient seed priming (experiment 3). At the end of the experiments, scoring of oxidative leaf damage, biomass production, chlorophyll status (SPAD), root length density, superoxide dismutase activities in leaf and root tissues, and the shoot mineral-nutritional status were determined. Positive effects on plant growth and particularly on root development at low RZT were detected exclusively for seaweed extracts with high Zn/Mn contents and similar growth promotions were induced by Zn and Mn application in comparable amounts. This finding suggests that the selected seaweed extracts were mainly acting via improved Zn and Mn supply to the plants. It was essential that the cold-stress protectants were present during seed imbibition. The beneficial effect of Zn/Mn treatments and sea weed extracts was associated with increased superoxide dismutase activity in the root and leaf tissue, with key functions in antioxidative stress defense, depending on Zn, Mn, Cu, and Fe as enzymatic co-factors. Accordingly, leaf damage, shoot and root growth inhibition in cold-stressed plants was associated with a low Zn-nutritional status, mitigated by application of the cold-stress protectants. Since micronutrients are effective already at low concentrations, starter applications of Zn/Mn or the respective seaweed extracts may offer an economic option for cold-stress prophylaxis in crops. Cultivation of tropical and subtropical crops, such as maize, soybean, or sorghum in temperate climates continuously increases as a consequence of global warming. However, for plant species like maize with optimum temperatures of 25–30 °C for germination and plant growth [1, 2], even moderately low soil temperatures <15 °C are already detrimental to root development, fine root branching, and root elongation [3, 4]. 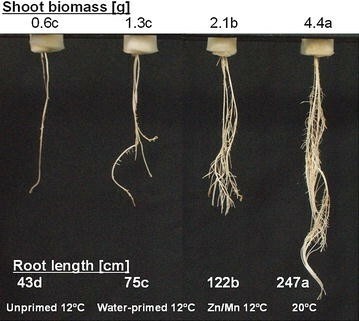 Apart from root growth, also root activity in terms of nutrient uptake and nutrient translocation, adaptive root exudation for nutrient mobilization , and hormonal balances are impaired by low root zone temperatures (RZT), [6, 7]. Particularly in maize, plant growth is not only affected by limitations of the root system, since also the shoot meristem is located close to the soil surface and remains belowground even until the V6 stage . Oxidative stress plays a significant role for the induction of chilling injury in low temperature-sensitive plants [9, 10], indicated visually by formation of oxidative leaf-damage symptoms, such as chloroses, anthocyanin formation, and leaf decolouration, later resulting in formation of necrotic areas (see Fig. 3). As an additional stress factor, also soil nutrient availability decreases with declining soil temperatures, as a consequence of lower solubility of mineral nutrients in cold soils, while the viscosity of water increases and reduces the speed of transport processes of mineral nutrients from soil to the root surface [11, 12]. Therefore, plant availability of sparingly soluble nutrients, such as P, NH4 +, K, Fe, Zn, Mn, and Cu is particularly affected by low soil temperatures. Under favorable conditions, short cold periods can be tolerated and later compensated during plant development until final harvest. However, longer stress periods can easily induce irreversible damage already in the seedling stage . Fertilizer placement close to the seedling roots is currently the most widely employed approach to support root uptake of limiting nutrients, such as P and N, in some cases also including Zn, Mn, and Fe as micronutrients. Imran et al. demonstrated that even soaking seeds in (Zn, Mn, Fe) micronutrient solutions (seed nutrient priming) could partially restore root growth and nutrient uptake of maize seedlings exposed to low RZT of 12 °C, associated with a final yield increase of 10 % in two independent field experiments. Application of seaweed extracts (mainly obtained from Asophyllum nodosum) with antioxidative and membrane-protective properties (reviewed by Sangha et al. ). Improving root growth and plant nutrient acquisition by inoculation with plant growth-promoting microorganisms (PGPRs), particularly using cold-tolerant bacterial strains (psychrotolerant bacteria) with the ability to maintain phytohormone production, nutrient mobilization (siderophores), or degradation of excessive ethylene levels even at low soil temperatures (reviewed by Subramanian et al. ). 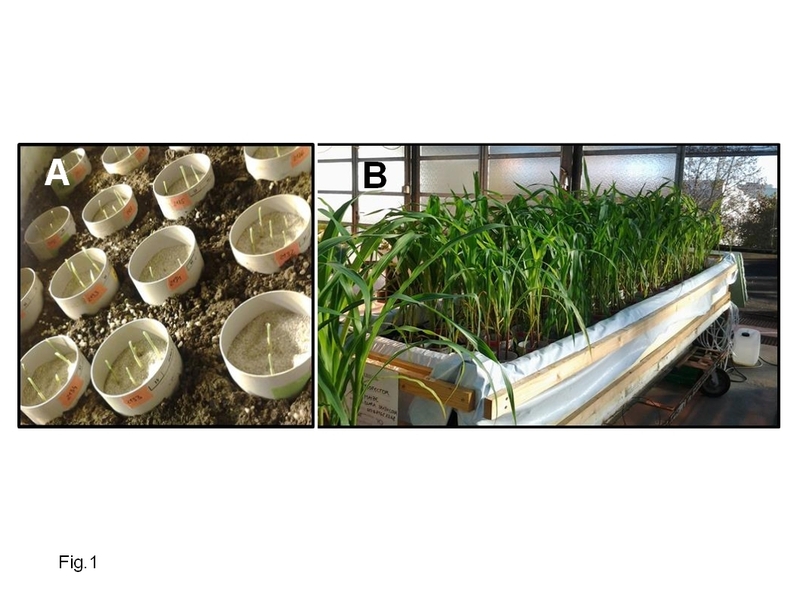 This study was designed as a comparative evaluation of approaches to mitigate cold-stress during early growth of maize under controlled root zone temperatures. The selected mitigation strategies comprised (1) fertigation and seed treatments with micronutrients (Zn, Mn) important for oxidative stress defense [14, 17]; (2) fertigation with seaweed extracts of different origins; and (3) inoculation with plant growth-promoting and psychrotolerant bacteria. Zea mays L cv. Colisee was used as test plant. Soil material (silty-loam, pH 6.9) was derived from the Ap horizon of a maize cultivation field site at the Hohenheim University experimental station Ihinger Hof, Renningen, Germany. After sieving with 2 mm mesh size, fertilization was performed with Ca(NO3)2, 100 mg N kg−1 DM; Ca(H2PO4)2, 80 mg P kg−1 DM; K2SO4, 150 mg K kg−1 DM and MgSO4, 50 mg Mg kg−1 DM. For improvement of the soil structure, the fertilized soil was mixed with quartz sand (ratio 2:1). Plastic pots with a volume of 1275 cm3 were filled with the soil substrate and inserted into a cooling system, designed to control the root zone temperature of plants. An immersion water bath circulator (Thermomix 1480/Frigomix 1497, Braun, Melsungen, Germany) was connected to the cooling system containing a closed pipe system, installed in moist peat culture substrate to circulate the refrigerating fluid through the moist peat layer. The plants were regularly watered to 70 % of substrate water holding capacity (WHC) with distilled water (Additional file 1: Figure S1). Hydroponic culture with a the nutrient solution containing 2 mM Ca(NO3)2, 0.7 mM K2SO4, 0.1 mM KCl, 0.5 mM MgSO4, 0.1 mM KH2PO4, 10 µM H3BO3, 0.5 µM MnSO4, 0.2 µM CuSO4, 0.01 µM (NH4)6Mo7O24, 0.5 µM ZnSO4, and 20 µM Fe–EDTA. pH 6.0–6.5 was performed as described by Imran et al. .
Commercial products and micronutrients (ZnSO4, MnSO4) were applied (1) as fertigation treatments with a pipette close to the plant, directly on top of the soil substrate in three weekly intervals, starting with the sowing date (experiment 1); (2) single starter fertigation vs three weekly applications for seaweed extracts, and Zn/Mn seed dressing with Lebosol® Mn500 SC and Lebosol® Zn700 SC (Lebosol® Dünger GmbH, Elmstein, Germany), according to the manufacturer instructions (experiment 2); (3) micronutrient seed priming (experiment 3) according to Imran et al. .
Proradix® WP (Sourcon Padena, Tübingen, Germany); active ingredient: Pseudomonas sp. DSMZ 13134. Dosage per application: 1*109 CFU kg−1 dry soil substrate. RhizoVital® FZB42 (ABiTEP, Berlin, Germany); active ingredient: Bacillus amyloliquefaciens subsp. plantarum. Dosage per application: 1*109 CFU kg−1 dry soil substrate. R41 (ABiTEP, Berlin, Germany); active ingredient: cold-resistant Bacillus simplex strain R41. Dosage per application: 1*109 CFU kg−1 dry soil substrate. Super Fifty® (BioAtlantis, Tralee, Ireland); active ingredient: Ascophyllum nodosum extract. Dosage per application: 17 mg kg−1 dry soil substrate. Algavyt Zn/Mn (Agriges, San Salvatore Telesino, Italy); active ingredient: extracts from Ascophyllum nodosum, Fucus spp., Laminaria spp., +Zn/Mn. Dosage per application: 16 mg kg−1 dry soil substrate. Algafect (Agriges, San Salvatore Telesino, Italy); active ingredient: extracts from Ascophyllum nodosum, Fucus spp., Laminaria spp. Dosage per application: 16 mg kg−1 dry soil substrate. ZnSO4 fertigation. Dosage per application: 0.5 mg kg−1 dry soil substrate. MnSO4 fertigation. Dosage per application: 0.5 mg kg−1 dry soil substrate. Zn/Mn seed priming. 4 mM Zn + 2.5 mM Mn solution as ZnSO4·H2O and as MnSO4·7H2O. Sixty seeds were soaked in 200 mL of priming solutions (distilled water as control) in the dark for 24 h. Thereafter, seeds were taken out, rinsed with running distilled water for 1 min to remove excess priming solution. Subsequently, seeds were air dried at room temperature for a minimum time period of 1 h .
Visual scoring of leaf chloroses and necroses was performed for experiment 1 and replaced by reflectometric leaf chlorophyll measurements (SPAD) for experiment 2. Plant height, root and shoot dry matter after 60 °C oven-drying, and root length measurements were performed for all experiments (WinRHIZO root analysis software, Regent Instruments Inc., Quebec, Canada). One hundred milligrams of dried shoot material was ashed for 5 h in a muffle furnace at 500 °C. After cooling, the samples were extracted twice with 1 mL of 3.4 M HNO3 and evaporated until dryness to precipitate SiO2. The ash was dissolved in 1 mL of 4 M HCl, subsequently diluted ten times with hot deionized water, and boiled for 2 min to convert meta- and pyrophosphates to orthophosphate. After addition of 0.1 mL Cs/La buffer to 4.9 mL ash solution, Fe, Mn, and Zn concentrations were measured using atomic absorption spectrometry (ATI Unicam Solaar 939, Thermo Electron, Waltham, USA). Spectrophotometrical determination of orthophosphate was conducted after addition of molybdate-vanadate color reagent (Hitachi U-3300 spectrophotometer, Hitachi LtD. Corporation Japan) according to the method of Gericke and Kurmies . Determination of Mg was conducted by atomic absorption spectrometry, while K and Ca were measured by flame emission photometry (ELEX 6361, Eppendorf, Hamburg, Germany). The superoxide dismutase (SOD) assay was optimized for root and shoot tissues of maize with reference to the method described by Beauchamp and Friedovich  and modifications suggested by Giannopolitis and Ries  and Hajiboland and Hasani . One hundred milligrams of fresh plant material, frozen in liquid nitrogen and stored at −80 °C, were ground with a pre-cooled mortar and pestle, and homogenized in 1.5 mL extraction buffer containing 25 mM HEPES pH 7.8 and 0.1 mM EDTA. After centrifugation at 10000×g (4 °C for 10 min), aliquots of the supernatant were transferred into 2 mL reaction tubes and kept on ice. For preparation of the reaction mixture, 1 mL cuvettes, covered with aluminum foil for light protection, were filled with 300 µL 62.5 mM HEPES, 75 µL 1.0 mM EDTA, 75 µL 120 mM Na2CO3, 75 µL 120 mM l-methionine, 150 µL 750 µM nitro-blue tetrazolium (NBT), and 100 µL of plant extract. Finally, 225 µL 10 µM riboflavin were added. The light reaction was started by removing the aluminum foil, exposing the samples to light (8000 Lux) for 25 min. During the light phase, NBT is reduced to a dark blue formazan, measured spectrophotometrically (U-3300, Hitachi, Tokyo, Japan) at a wavelength of 650 nm. The final SOD activity, which inhibits the NBT reduction, was calculated as difference between absorbance of the sample and a control without plant extract, divided by 50 % absorbance of the control. The SOD activity was expressed as SOD units per g fresh weight (FW). The study was carried out in a completely randomized design. Data are presented as mean ± SE. For statistical analysis of significant differences between treatment groups, a one-way ANOVA followed by a Tukey test (p < 0.05 significance level) were performed using the SAS/STAT software package of SAS® 9.3. Maize seedlings, germinated for 2 weeks on a silty-loam soil pH 6.9 (taken from a maize field site) at a root zone temperature (RZT) of 20–22 °C, followed by a two-week low RZT treatment with 12–14 °C and a recovery period of 10 days, exhibited significantly reduced shoot growth as compared with the unstressed control (Fig. 1). During the cold-stress period, plants developed leaf chlorosis, subsequently turning into necrotic spots, associated with anthocyanin formation, which finally affected 30–40 % of the total leaf area (Fig. 2). A significant reduction of leaf damage was observed after Zn/Mn fertigation (5 % affected leaf area) and in the treatments with the seaweed extract combination products Algafect and Algavyt+Zn/Mn (Ascophyllum nodosum, Fucus spp., Laminaria spp. ; 0–15 % affected leaf area) but not for the pure Ascophyllum nodosum extract Super Fifty (40 % affected leaf area, Fig. 2). Accordingly, shoot growth inhibition, induced by low RZT was reverted particularly in maize plants with Zn/Mn and Algavyt+Zn/Mn fertigation (Fig. 2). By contrast, the treatments with plant growth-promoting rhizobacteria had no protective effects on formation of leaf necrosis (Fig. 2) and inhibition of shoot growth (Fig. 1) under low RZT. Combinations of the PGPRs with the seaweed extract Algafect resulted in a reduction of necrotic leaf area but the effect was not bigger than the treatment with the seaweed extract alone (Fig. 2). The beneficial effects of fertigation with Zn/Mn, Algafect, and Algavyt+Zn/Mn on cold-stress-induced leaf necrosis and inhibition of shoot growth were associated with a doubling of root length density (Fig. 3), indicating strong effects on root elongation and fine root production with outstanding importance for nutrient acquisition . A closer look on the nutritional status of the damaged leaf tissue in cold-stressed maize plants  revealed deficiencies of Zn (7.3 mg kg−1 DM, critical threshold 20 mg kg−1 DM) and Cu (3.2 mg kg−1 DM; critical threshold 5 mg kg−1 DM), not detectable in the corresponding leaves after fertigation with Zn/Mn and Algavyt+Zn/Mn (Fig. 3). The Mn concentrations were sufficient in all treatments (40–50 mg kg−1 DM), while the P status of 0.25–0.3 % was low but not critical (data not shown). Analysis of critical nutrients supplemented with the applied cold protectants revealed high levels of Zn and Mn as common micronutrients present in the seaweed extracts Algafect, Algavyt+Zn/Mn (6–70 mg kg−1 DM), and in the Zn/Mn fertigation solution, exerting beneficial effects on cold-stressed plants but not in the pure Ascophyllum nodosum extract Super Fifty and in the microbial inoculants (≤0.06 mg kg−1 DM), lacking protective activity (Table 1). In face of the obvious indications for a role of micronutrients, such as Zn in cold-stress mitigation by the applied cold-protectants, a second experiment was conducted to investigate a putative link with SOD as key enzymes in oxidative stress protection, with Zn, Mn, Cu, and Fe as co-factors . Moreover, in the first experiment, fertigation with cold-protectants was performed in weakly intervals during the first 3 weeks after sowing, difficult to perform under real practice conditions. Therefore, in the second experiment also the more realistic option of a single starter application of promising cold-protectants at the time of sowing was tested: Algavyt+Zn/Mn was supplied as single fertigation treatment directly after sowing, as compared with three weekly applications. Zn/Mn was supplied once as a starter application, using a commercial seed-dressing formulation (Lebosol Dünger GmbH, Elmstein, Germany). At 6 weeks after sowing, shoot length and shoot biomass production of maize plants exposed to low RZT of 12–14° C was increased by approx. 20 and 30 %, respectively, in the treatments with cold-protectants without differences between single and triple applications of Algavyt+Zn/Mn (Fig. 5a, b). Cold-stress-induced leaf chlorosis (SPAD values) declined in the order Zn/Mn < Algavyt+Zn/Mn (three applications) = Algavyt+Zn/Mn (one application) < untreated control (Fig. 4C). Declining leaf chlorosis was associated with increasing Zn leaf concentrations (Fig. 4D) and increased activity of superoxide dismutase in the leaf and root tissue (Fig. 4D, E). Mineral nutrient analysis  revealed a low but not critical status for P (0.23–0.3 %) and Mg (0.17–0.19 %), and Ca and K concentrations in the sufficiency range, without significant treatment differences (Table 2). The micronutrient status of the untreated control was deficient for Zn (12 mg kg−1 DM) and Mn (24 mg kg−1 DM), increased after application of cold-stress protectants and reached the sufficiency range in the Zn/Mn seed-dressing treatment. The Fe and Cu status was low but not critical without significant differences within the treatments (Table 2). For all investigated nutrients, total shoot contents increased in response to the treatments with cold-stress protectants (Table 3), demonstrating an improved nutrient acquisition in general. Generally, effects of single Algavyt+Zn/Mn treatments were not smaller than the effects of triple applications, and were most pronounced in Zn/Mn seed-dressing treatments (Fig. 4; Tables 2, 3), demonstrating the outstanding importance of a starter application at the time of sowing. This was further confirmed in a nutrient solution experiment with seeds, pre-soaked in Zn/Mn nutrient solutions and water, respectively, subsequently germinated between filter paper and transferred for 5 weeks to a full-strength nutrient solution containing all essential mineral nutrients. During 4 weeks of the culture period, the nutrient solutions were cooled to 12 °C. Analysis of plant growth revealed a cold-protective effect of Zn/Mn treatments only when the micronutrients were applied as seed treatments prior to the onset of the cold-stress period. By contrast, even continuous supply of all essential nutrients in unlimited amounts via the nutrient solution during the cold-stress period directly to the roots of the maize seedlings, had no protective effects, as demonstrated by the control variant without Zn/Mn seed treatment (Fig. 5). This study was designed to compare the efficiency of different mitigation strategies against low root zone temperatures during early growth as a major constraint for maize cultivation in temperate climates [1–4], including supplementation of critical micronutrients (Zn, Mn) , application of seaweed extracts , and inoculation with plant growth-promoting and cold- tolerant bacteria . Surprisingly, despite a proven plant growth-promoting potential [24, 25] even in combination with the tested maize cultivar [26, 27], the investigated microbial inoculants, including a psychrotolerant strain of Bacillus simplex, failed to show any beneficial effects on growth of maize seedlings exposed to moderately low RZT of 12–14 °C. It remains to be established whether other cold-resistant microbial inoculants, directly isolated from the maize rhizosphere, such as Acinetobacter rhizosphaerae BIHB727, Pseudomonas putida B0, or Mycoplana bullata MpB46 , could be more effective in this context. In accordance with the observations of Imran et al. , supplementation of critical micronutrients, particularly Zn, was effective in mitigating growth depressions (Fig. 1) and oxidative leaf damage in maize seedlings exposed to low RZT (Fig. 2). Oxidative stress may represent the physiological link between micronutrient supply and chilling tolerance, and has been characterized as an important stress factor in cold-stressed plants . Reduced shoot and root growth of maize plants exposed to low temperatures has been attributed to severe oxidative damage induced by cold stress [13, 29]. The different isoforms of SO as key enzyme for detoxification of free radicals, strongly depend on Zn, Mn, Cu, and Fe as co-factors and have been implicated in chilling tolerance of higher plants . Accordingly, our study revealed increased in vitro activity of SOD in leaves by supplementation of mineral Zn/Mn fertilizers (Fig. 4). In addition to the mitigation of oxidative leaf damage and shoot growth inhibition, as one of the most striking effects, fertigation with Zn/Mn solutions or Zn/Mn-rich seaweed extracts (Algafect, Algavyt+Zn/Mn) doubled the root length density of cold-stressed maize plants (Fig. 4), similarly reported also by Imran et al. . Apart from lipid peroxidation, an increased oxidative degradation of auxins as a consequence of CuZnSOD limitation has been discussed as a mechanism for reduction of plant growth in response to Zn deficiency [6, 30]. Accordingly, external Zn/Mn supply to cold-stressed plants inducing an increased SOD activity (Fig. 4), may exert a protective effect against oxidative auxin degradation, thereby maintaining auxin levels sufficiently high to trigger root and shoot elongation even at low RZT. Recent studies also suggest that particularly auxin transport rather than auxin synthesis is affected by cold stress . Stimulation of root growth may explain the increased accumulation also of other mineral nutrients in the shoot tissue of the Zn/Mn-treated maize plants (Table 3) as a consequence of improved spatial nutrient acquisition. However, apart from auxins, cold stress affects hormonal balances via positive and negative interactions with a wide range of phytohormones and signal compounds, including cytokinins, gibberellins, jasmonic acid, ABA, salicylic acid, and there is no information on putative effects of micronutrient availability on these processes . Surprisingly, improved Zn/Mn supply seems to be also the mechanism behind cold-stress mitigation mediated by application of seaweed extracts, since only seaweed extracts rich in Zn/Mn (Algafect 20.8/6.6 mg kg−1 DM; Algavyt+Zn/Mn 71.9/59.6 mg kg−1 DM) exerted protective effects against low RZT, while the highly concentrated and purified Ascophyllum nodosum extract “Super Fifty” without detectable Zn/Mn contents was completely ineffective (Fig. 2). This result was unexpected since in the available literature, protective effects of seaweed extracts against abiotic stresses have been mainly related with the organic fraction [15, 32]. However, in many cases these applications refer to foliar treatments  and to extracts obtained with lipophilic solvents supplied in agar media . It is not clear whether the same compounds are active in the fertigation treatments applied in the present study, since adsorption and microbial degradation processes may occur in soils, as a source of interference not present in case of foliar applications. More detailed chemical fractionation experiments are required for further testing the hypothesis that micronutrients and particularly Zn are the major active ingredients of seaweed extracts used for soil applications as antioxidative cold-stress protectants. Another interesting result was the finding that the application timing of the cold-stress protectants was obviously more important than the number of applications, and single starter applications of Zn/Mn or Zn/Mn-rich seaweed extracts were equally effective than weekly applications during the first 21 DAS (Fig. 4). The nutrient solution experiment even demonstrated that Zn/Mn treatments could only exert a protective effect against cold stress when the micronutrients were present during seed imbibition prior to the onset of the cold-stress period. This effect could not be replaced by later applications of micronutrients to the germinated seedling roots, even with unlimited supply of all essential nutrients in a full nutrient solution (Fig. 5). Since the micronutrients are taken up by the seeds during imbibition , this may indicate that only the micronutrient fraction already present in the plant tissue can exert a protective function after onset of the cold-stress period, while root uptake from the external medium is largely inhibited under these conditions. This is in line with observations of Engels et al. [32, 33], demonstrating that Zn and Mn shoot accumulation in maize exposed to low RZT was particularly dependent on cold-stress effects affecting root activity, while the uptake of other nutrients was more strongly determined by the shoot demand. The efficiency of starter treatments with micronutrients or seaweed extracts could also be a big advantage from the practical point of view, since it facilitates integration into common sowing techniques, such as seed dressings or underfoot placement of fertilizers, provided that suitable formulations are available. By contrast, repeated applications would largely increase the application costs due to a higher dosage and additional workload. Since micronutrients are effective already at low application doses, starter applications of Zn/Mn or the respective seaweed extracts may offer a highly economic option for cold-stress prophylaxis in crops. Assuming a field planting density of six maize plants m−2 (60.000 plants ha−1), one single application of Zn/Mn-rich seaweed extract would translate into a dose of approx.1 kg ha−1. In case of Zn/Mn sulfate fertigation, already 30 g ha−1 would be sufficient. Recommended dosages for underfoot placement are in the range of 300 g ha−1. In case of micronutrient seed priming , the dose would be even lower (2–3 g ha−1) and translated into a maize grain yield increase of approx. 10 % in two independent field experiments . The beneficial effects of starter treatments with micronutrients (particularly Zn) or seaweed extracts acting via the antioxidative stress defense system on cold-stress tolerance of the target plants are obvious but the detailed mode of action is still not fully understood. Also field performance requires further confirmation on different soils. The various successful application modes and formulations, such as seed priming, seed dressing, fertigation, supplementation in form of pure mineral nutrients or as seaweed extracts may offer high flexibility for different sowing techniques, underfoot fertilization, organic vs conventional farming etc., but still requires optimization of the application dosage. Apart from improved cold-stress tolerance, both, micronutrient fertilization and seaweed extracts have documented effects on plant growth promotion and tolerance against other biotic and abiotic stress factors [16, 17, 34]. Therefore, additional beneficial effects may be expected under stress conditions not addressed in the present study. KB, NFW, and NMT equally contributed to the setup and evaluation of the soil culture experiments under controlled RZT and prepared the manuscript. MW was involved in setup of the cooling system and adaptation of the SOD determination. MA and MI were responsible for the nutrient seed priming experiment in hydroponic culture. GN designed the experiments and was involved in proof reading and final editing of the manuscript. All authors read and approved the final manuscript. This work was supported by the European’s Seventh Framework Programme (FP/2007-2013) under Grant Agreement no. 312117. 40538_2016_69_MOESM1_ESM.jpg Additional file 1: Figure S1. Cooling system for adjustment of low root zone temperature based on mois peat culture substrate with cooling tubes. A) Pots with germinating maize seedlings inserted into the cooling system. B) Overview at final harvest.